Slushy ice, in other words. 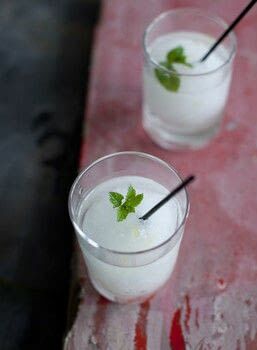 In Italy, sgroppino is a grown-up concoction of Prosecco, vodka and sorbet served as a cocktail. I make this elderflower version for my children on especially hot days. By all means make a Prosecco version when the kids have hit the sack. Place the sorbet scoops in a jug and add the sparkling elderflower pressé to the jug. Whisk together by hand until combined and you have a thick slushy ice. Divide the slushy sorbet between 4 glasses and stir each with a spoon, topping up with a little more elderflower pressé if needed. Top each glass with a mint or lemon balm leaf to make it look especially lovely.